This chapter discusses the basic differences between HTML web apps for desktop browsers and web apps for iOS devices. 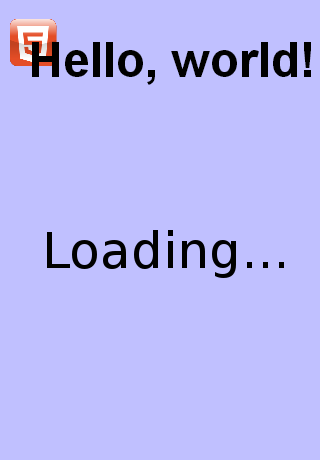 It assumes that you are familiar with the previous chapter Getting Started with HTML Web Apps. If you haven't read that chapter yet, you should read it first. You can change the orientation of an iOS device by tilting it and the web app will be rotated accordingly; however, the web app might then no longer fill the whole display because it uses an incorrect viewport. On an iOS device, you can pan and zoom the web app with the default touch gestures, which makes sense for standard web pages but usually doesn't make much sense for web apps. You can add a link to the web app to the home screen of the iOS device by tapping the share icon and then tapping “Add to Home Screen”. However, this link will just open the web app with Safari and therefore it won't work if your iOS device is not connected to the internet. This chapter explains how to address these issues; i.e., it shows how to set the correct viewport size, how to handle orientation changes, how to disable the default touch gestures, and how to configure the web app such that users can download it to their device and use it offline like any other app (without indicating that it runs in Safari). An example that integrates all these techniques is presented at the end of this chapter. Orientation changes can be used to call an event function (similarly to onresize but using onorientationchange); however, orientation changes usually also result in resize events. Thus, it is sufficient to update the content of the canvas for the new width and height. If you want to render different contents for portait and landscape orientation, you can check whether the width is larger than the height (landscape orientation) or the height is larger than the width (portrait orientation). Apple developers can find more information about setting the viewport in Apple's Safari Web Content Guide under Configuring the Viewport. More information about handling orientation changes is available under Handling Events. Additionally, this tag includes the attribute style="-webkit-user-drag:none; -webkit-user-select:none; " in order to disable any user interaction with HTML elements of the web app. Apple developers can find more information about preventing the default behavior in Apple's Safari Web Content Guide under Handling Events. For Apple developers, more information is available in Apple's Safari Web Content Guide under Configuring Web Applications. More information for Apple developers is available under Configuring Web Applications. Other options are default and black-translucent. For Apple developers, more information is available in Apple's Safari Web Content Guide under Storing Data on the Client. HTML5 specifies the related offline web applications. The Mozilla Developer Network offers a good introduction to using the application cache. The complete example is available online such that you can easily try it out. Note that there is also a title tag, which specifies the default name of the web app when you download it to an iOS device (via tapping the share icon). Once you have added the web app to the home screen of an iOS device, you should start it once with an active internet connection. After that you should be able to start it even if the iOS device is offline. When you develop for Safari on an iOS device, remember to save files under new names after every edit and use the new files in order to make sure that Safari doesn't use a cached version (without your changes) of the files. This page was last edited on 15 August 2013, at 13:15.